Carpal Tunnel Syndrome Handout | Dr. Thomas Trumble, M.D. Carpal tunnel syndrome is a condition where there is a compression of the median nerve at the level of the wrist. This results in numbness and tingling of the fingers, particularly the thumb, index finger, and half of the ring finger. In carpal tunnel syndrome, there is a thickening of the ligaments or the tendons resulting in increased pressure on the median nerve. The median nerve travels to the carpal tunnel to supply the muscles to the thumb, sensations to the thumb, as well as sensation to the index finger, middle finger, and the radial half (thumb side) of the ring finger (Figure 1 and Figure 2). Who has Carpal Tunnel Syndrome? Patients who have a history of symptoms involving nighttime numbness or tingling in the fingers, relieved by shaking of the hand is one of the most common symptoms. On clinical exam, patients often have sensitivity with percussion or tapping over the median nerve at the level of carpal tunnel and with wrist flexion that often produces increased numbness. Patients often remark that activity such as using a hair dryer, holding a cell phone, or holding a book exacerbates the symptoms. One of the best tests to confirm carpal tunnel syndrome, most particularly to determine the severity, is an electrodiagnostic test. This test involves using small amounts of electrical stimulation to map out the areas of the nerve that are not functioning correctly. A nerve that is functioning properly will conduct at a very fast speed, whereas a nerve that is under pressure will conduct at a much slower speed. A robust blood supply is necessary. 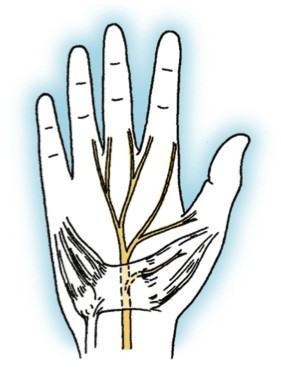 Carpal tunnel syndrome decreases the blood supply of the nerve because of the pressure. 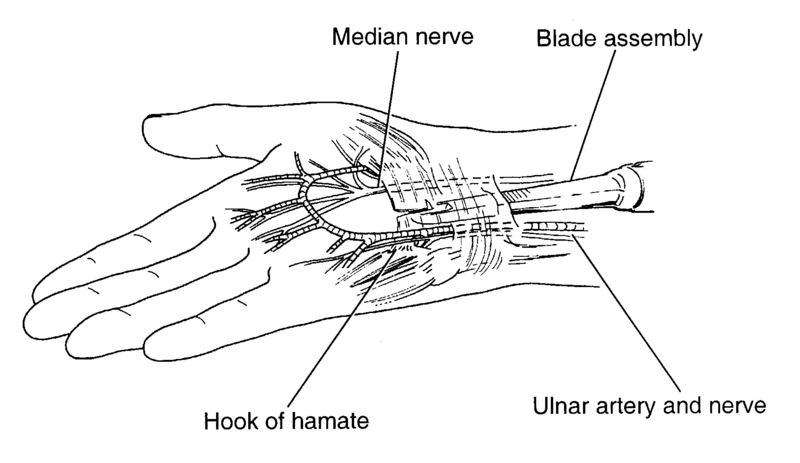 Therefore, because of the increased pressure seen in Carpal Tunnel Syndrome, the blood supply to the nerve is decreased. In the early stages of carpal tunnel syndrome, wearing nighttime splints can provide a great deal of relief. Steroid injections have not been shown to provide long-­‐term relief of carpal tunnel syndrome. However, an injection can allow the patients to have 2-­‐3 months of relief. For that reason, we typically reserve this treatment for patients who know they need to have surgery, but will be traveling or have other urgent reasons to delay the surgery. The standard surgery involves a fairly large incision in the palm (Figure 3). This was the standard of care for several decades. However, many physicians such as myself noticed that this incision was very painful and took a long time to recover from. A technique was developed for an endoscopic carpal tunnel release. This uses a small incision at the level of the wrist where the incisions are not as sensitive. The endoscopic device is then inserted. Next, the blade is deployed and this allows the ligament to be released or opened. Ultimately, the ligament heals with tissue that is very similar to the original ligament, but at a longer length that does not cause constriction of the nerve. Recurrences of carpal tunnel syndrome can happen after surgery, but it is extremely rare. One of the most important factors of the surgery is that it is done very carefully in a true surgical environment for patient safety. The procedure whether it is done open or endoscopic, is performed very close to two of the key nerves, the median nerve and the ulnar nerve. In a study that I published in the Journal of Bone and Joint Surgery that combined patients from the University of Washington and University of California, the endoscopic technique was shown to cause much less scar sensitivity, have a short recovery and an early return to work. There was noted to be no increase in risk to the patients with the endoscopic technique.